To redesign the NPR One app around the concept of an appliance, I had one simple test in mind: does this pass the "I'm cooking in the kitchen with wet hands and not wearing my glasses" test. Here's what I came up with. This is isn't an app, it's an appliance. Like a toaster, a flashlight or an elevator. 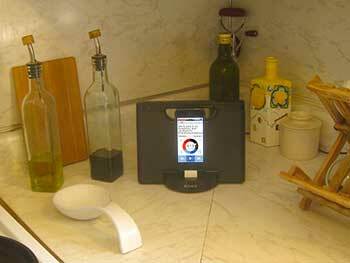 Big buttons, clear fonts, and tiered functionality help users distracted by the usual radio-listening activities (driving, cooking, laundry, etc.). 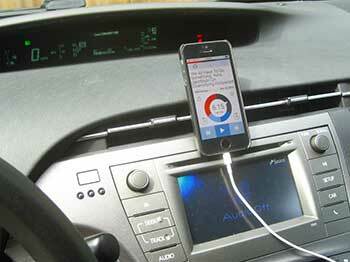 A gadget interface, instead of a print-influenced layout. Branding breakthrough: inserting the NPR One logo into the interface merges the app with the brand, the organization, and the audio experience itself. A strong visual vocabulary to quickly deliver the five context clues that users mentally triangulate when deciding to stay or pass on a story. The controls (1,4) are in blue, and form bookends. The content stage (2,3) is white, and framed by the bookends. Eye travel is minimized by corralling high-value frequently-used data to the vertical center. Primary: big dark blue buttons on the bottom. Easy generous tap targets. Too floaty. These 6+ elements, above the NPR brand color bar, are just too floaty. Sure, two rows are implied in the iOS ‘breakthrough’ design, but even as minimalism goes, this is too much. Page-loading progress bar? Because of its positioning and thin size, I sometimes confuse this for the iOS Safari page loading progress bar. (Sometimes I swear the black bar appears to move right!) And as a branding exercise, it feels like a missed opportunity. Brand bar, double duty. The thick branding bar clearly sets apart the phone business versus the app business while also providing a satisfying brand presence. The phone bar is valuable. Setting the phone status bar apart (in stark utilitarian white) makes it a first-class citizen -- not an awkward house guest. This data is important; users reference these status indicators when using the app: “Do I have enough time, enough battery charge, and enough wifi signal for this fantastic 20-minute segment? Or should I save/heart it for later?” This phone bar looks deliberate, purposeful, valuable -- not begrudgingly bolted-on. Primary menu. This is the primary menu as users expect. A hamburger or similar icon would be optimal, but the User icon appears here for the sake of continuity for existing users. Search is shifted to center. Search is crucial but doesn’t warrant a top-left corner position in the UI (where the primary icon or hamburger might go. My Content / My Stuff. This content tag-teams with the heart icon below to display saved or favorited items. It's a flexible junk drawer for lists of stories: Saved/hearted stories, previously heard stories, featured stories, etc. A frequently used button, it’s on the right hand side. I often look up from cooking and glance at the headline to contextualize what I’m hearing. This is especially true for reporting styles and segments that feature an extended intro or nut graph -- where the topic or theme isn’t always immediately discernible. Tiny narrow gutters. Edge-to-edge letters to accommodate more characters and offset the cost of the larger font. Sure, in a print design, this zero gutter would look crowded, but it’s an appliance where utility reigns. Font makeover. For better usability. This font (Roboto) is full jet black (not grayscale) and larger. It’s sharp and readable from across the kitchen. Line height is super tight. To fully leverage the real estate. Narrow font. To accommodate more characters and words per line. Clipped headlines are a problem. The audio they’re now hearing. The source of the program. Framing the headline. The context bar divides the headline zone above from the audio controls below. Framing helps users to quickly orient to the app and focus on the text. The source is more visible. The content’s source is a major factor in helping the user contextualize what they’re hearing, e.g. when I see “On the Media” versus “TED Talks,” it changes my perception. The date is more visible. Being upfront with users (that some content is from the vault) helps to build the trust that curators must continually earn. And finally, for the ta-da moment: the logo itself is inserted into the interface. 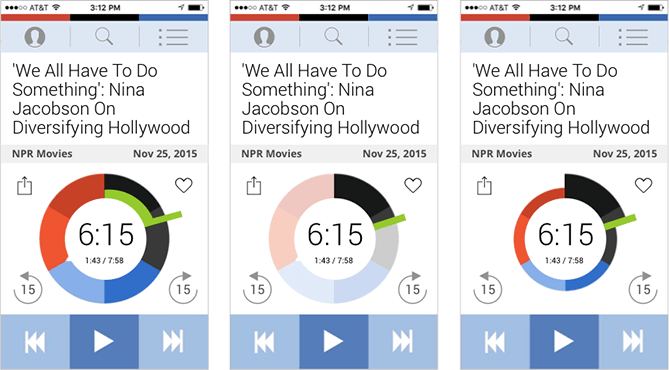 Serving as a circular progress bar, the story clock deeply merges NPR, the app, and the concept of listening to audio. 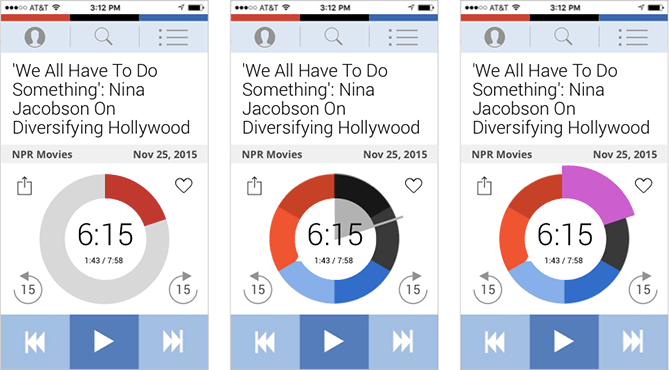 Infusing the brand logo for NPR One into the interface as a core element is a massive game changer. This could ultimately become NPR’s logo and identity. NPR = audio. Audio = NPR. No zazz? The only time I ever really see this element is this initial state: a stationary-looking blue “i” next to a gray box. There is no joy in this visualization of the audio experience. Grayscale ghostly. The size, color and positioning of this text sends a signal that it’s not relevant. Yes, grayscale signals info tiers, but how light is too light? Big chunky numbers clearly tell users how much time remains. Users instantly know what it is. The Moving Notch. Previously static and pointing (arbitrarily?) at the 8 o’clock position, the notch is now a dynamic progress indicator, spinning steadfastly around to the final 12 o’clock position. When at rest (and in static images), it’s pointing straight up -- at the beginning, at the ending. The alpha and the omega. Like a rocket. Power on. Here we go. Confusing icon. This icon looks like the Venus female gender symbol. When my brain tries to pair the Venus symbol with the nearby Mars-ish male arrow, it's distracting to me (and possibly Prince). My best guess is that it’s a lightbulb, though that has its own connotative messaging troubles. So the challenge: how to select a familiar icon for up-voting interestingness? Platform-specific share icon. An Android-ism? Native iOS share icon. Given the potential for confusion with platform icons and confusion with emojis, going native seems helpful. Save / heart button. To save or bookmark stories for later. The heart is such an ideal icon. As New Yorkers will tell you, it’s more than a symbol of romantic love. It signifies approval, passion, and affinity in a way that’s both meaningful and safely generic. Even Facebook feels hemmed in by the Like button. Rewind 15 seconds. Essential for modern life. Fast-forward 15 seconds. When I’m in the car with the kids, I wish I had a way to skip over inappropriate content (e.g. newscasts with brief but graphic carnage reports). Otherwise, I’m forced to skip the entire segment via the Next button. I wanted to share the story only AFTER it ended. But now it’s too late because I can’t go 'back' to it. Maybe it’s in the history somewhere? When kids in the car ask to “play that again” -- but the car audio's Back/Previous button doesn’t work as expected. I can’t fiddle with the history at 65 m.p.h. Next story! This is the magic button. The app's latest incarnation doesn’t have a background color, but I love the huge visual tap targets here. Another pause button. The white circle in the Story Clock is also a pause and play button. This may seem surprising, but the concept of using the notch as a status indicator for the progress bar in the NPR Story Clock was not obvious to me for a long while. Maybe it was a traditional reluctance to alter an existing logo mark? In order, here are the alternative versions I explored. My first sketches, drawn on post-its on the kitchen table. Every once in a great while, an idea comes around that perfectly captures a rare intersection: what people want, what an organization does, and what technology can deliver. 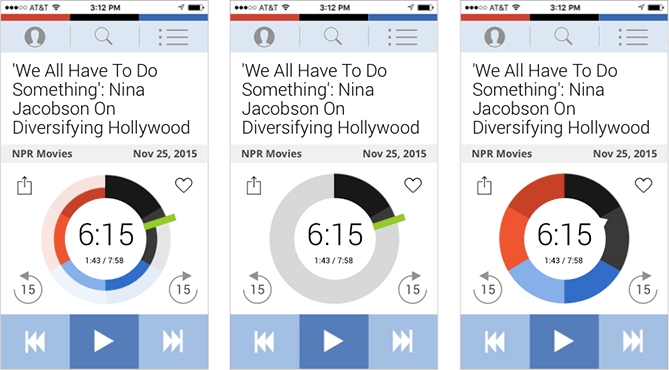 The NPR One app is one such triumph. It's not just another streaming or news app -- it's a whole new way of listening to radio and podcasts. It's like magic. Just turn it on and out comes an ideal mix of content that is consistently engaging. Don't like what you're hearing? Skip ahead (which is the recurring dream for any radio listener who's ever pondered time travel while patiently waiting-out a segment). NPR One is like getting a gift certificate at your favorite store; you don't know what you're going to get, but it's going to be good. 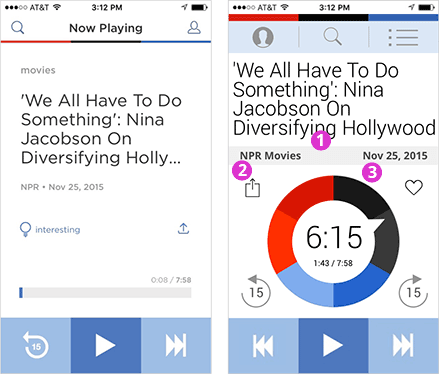 The triumph of the NPR One app couldn't come at a better time for NPR, as it ponders its future and strategy in a shifting, crowded, and financially struggling media landscape. 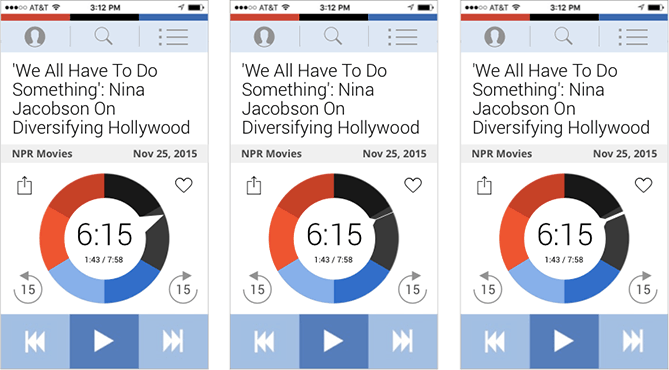 Seemingly overnight, the NPR One app has vaulted to become my favorite and most-frequently used smartphone app. The a-ha moment for me was seeing those big wonderfully oversized buttons. It struck me instantly: this is isn't an app, it's an appliance. This app wasn't intended to be merely looked at, it's supposed to be used. Like a toaster, a flashlight or an elevator. So earlier this year, when NPR sent me a survey, asking how they might improve the app, I decided to go one step further and redesign the main screen, building on the idea of an appliance. 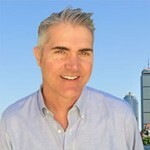 BlueSkyMinds principal Rob Condit is a UX architect and content strategist. For more on his work, see his recent projects and LinkedIn. On a lighter note, the nation of New Zealand recently considered a new flag, an effort fueled by the desire to assert a post-colonial identity. Yet to the disappointment of flag change advocates, voters ultimately chose to keep the existing flag over the other finalist, the Silver Fern flag. If our country was a car, what would our brand be? To anyone who’s ever been part of a design selection committee, it’s not entirely surprising that a nation might fail to agree on a piece of collective art that would serve as a national brand and identity. Or agree that any change was needed at all. Still, the national “project” yielded some excellent options, including my personal favorite, Fire the Lazar!, a laser-firing kiwi. Throughout the decision process, project designers created virtual waving flags to enable voters to see the flags in their natural context and try-before-they-buy. To create a digital product, six elements overlap each other to define six disciplines. Here's a handy visualization of how these areas dovetail and compliment each other. Hover between each element below to reveal the overlapping discipline.